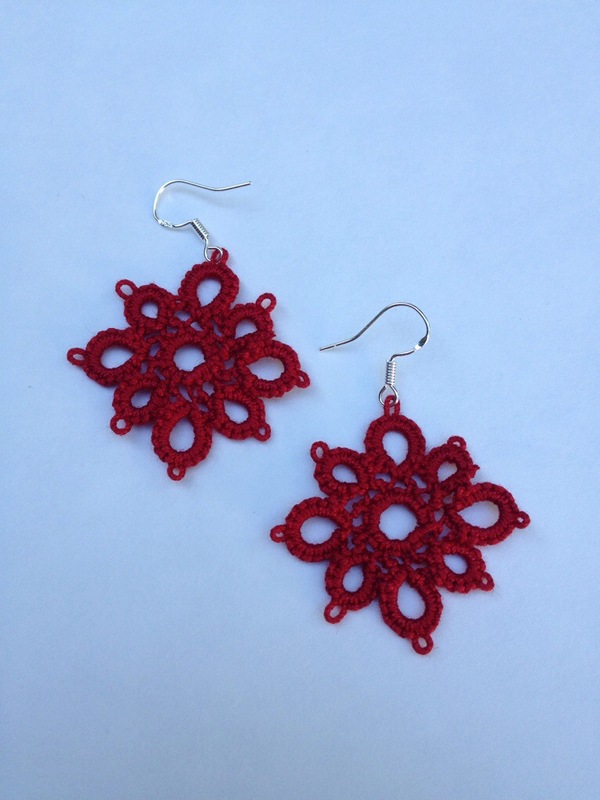 These little earrings are part of a group that I’m taking in to a shop in Issaquah to put on consignment. It’s my first “official” consignment gig, though it’s something I’ve wanted to do for a while. I’m trying to keep my expectations in check with a goal of just figuring out how to get myself organized for doing consignment rather than an actual sales goal. I like goals I have control over. My second test run is this post itself. I know I’ve been quite absent from posting and I don’t mean to be, but the fact is that I just don’t use my computer at home much. Once I get home I try to stay out of work mode and sitting down at the computer just doesn’t help with that even if it’s for something fun like posting. So I’m trying out the wordpress app for the phone and iPad and hopefully they will be a more sit back bad relaxing way of posting. So please excuse any strange formatting or auto-corrects that come in the next few posts. I’ll get it figured out eventually. Somehow despite the crazy packing for the move (movers come next Thursday!) I’ve managed to get a fair bit of tatting done. Here’s to cleaning and sorting the tatting corner and finding all sorts of goodies I had forgotten I had! It’s been about two months since Shuttlebirds and since I last posted here, but tonight I finally took the time to sit down and get most of my threads listed on Etsy. I say most, because there’s a still some others that I only had a few of each color combination and I just didn’t get around to. Maybe I’ll get them listed in the future, but for now I’m happy with the 32 color and size combinations I have listed in the shop. 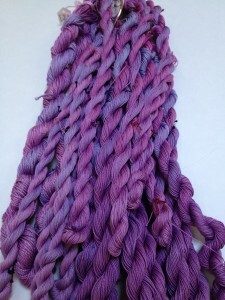 Now that I’ve got my listing process figured out (only took two months…) I’m looking forward to dyeing some more threads and getting them listed as soon as they’ve dried and been twisted into skeins. Might still take meanwhile. Just to add to the busy-ness of life, we will be moving at the beginning of next month so we’ve been rather distracted with packing up the house. We’ve been trying to take it slowly and carefully and I think we’ve actually been doing a pretty calm job of it. Starting a few weeks ago we’ve been each packing up at least one box a day and it’s actually it seem doable. This weekend we decided that we’ve probably got to pick up the pace and do more than just one box a day, but I think we’re still going to be able to keep the stress down for another week or two. I know the last week is going to be crazy, but we’re not moving far and we should have a couple days for the actual move, so if we can get the packing done we should be in good shape. 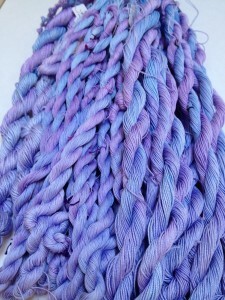 Hopefully lots of threads sell and they don’t have to be moved to the new place!